How Russia Went From Uniting To Dividing U.S. Politics : Parallels When the Soviet Union collapsed on Christmas Day 1991, it appeared Moscow would no longer dominate U.S. foreign policy. A quarter-century later, Russia has emerged as a hugely divisive presence. 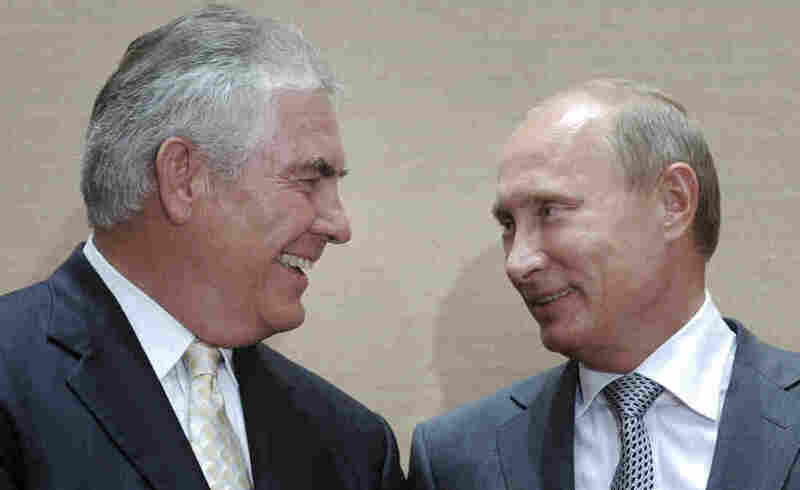 Russian leader Vladimir Putin (right), and Rex Tillerson, the head of ExxonMobil, smile during a signing ceremony for an oil agreement in Sochi, Russia, in 2011. Tillerson is widely reported to be President-elect Donald Trump's favored choice for secretary of state. U.S. policy toward Moscow used to be a unifying issue among Republicans and Democrats, but now it's a source of division. The Soviet Union, which collapsed 25 years ago on Christmas Day, united the American political establishment for decades, generating a unanimous view that Moscow represented the primary threat to the U.S.
Today's Russia is having the opposite effect, dividing many Republicans and Democrats and illustrating the larger breakdown of a national consensus on major foreign policy questions. Throughout the Cold War, the U.S. approach toward the Soviet Union, and international relations in general, was encapsulated in 1948 by Republican Sen. Arthur Vandenberg: "We must stop politics at the water's edge." Yet Republicans and Democrats are now waging a fierce battle over precisely what role Russia played in the U.S. election and how Donald Trump's incoming administration should deal with Russian President Vladimir Putin. Both U.S. parties have shown extreme flexibility in recent years, with each labeling Russia a serious — or not-so-serious — threat, depending on their short-term domestic political agendas. In the 2012 presidential election, Republican nominee Mitt Romney described Russia as "our No. 1 geopolitical foe." He called President Obama naive for his failed attempt to reset relations with Russia, a country that "lines up with the world's worst actors." Obama responded by mocking Romney with this zinger in a presidential debate: "The 1980s are now calling to ask for their foreign policy back because the Cold War's been over for 20 years." That was one of the more memorable lines of the campaign. But Russia's been extremely busy since then, with Putin annexing Crimea in 2014, backing separatists in Ukraine and launching a bombing campaign that has significantly strengthened Syrian President Bashar Assad. Republicans have repeatedly decried Obama's response as too tepid. In the wake of the 2016 presidential elections, party leaders have largely reversed positions. Based on the findings of the CIA and other intelligence agencies, many Democrats are outraged over what they say was Russia's effort to tip the election in favor of Republican Donald Trump. Obama, with barely a month left in office, has called for an investigation before his term ends Jan. 20. Trump, meanwhile, exchanged compliments with Putin during the campaign and has rejected the notion that Moscow played a role in the election. He has repeatedly expressed his desire to build better relations with the Kremlin, saying, "Why not get along with Russia?" Trump is reportedly leaning toward Rex Tillerson, head of ExxonMobil, as secretary of state, a man who's clinked champagne glasses with Putin as part of oil deals worked out in Russia. Putin in 2013 presented Tillerson with Russia's Order of Friendship, a high civilian honor. Russia, it seems, has become just one more place to squabble on the partisan playground. The Economist, the British publication with a strong pro-American bent, says this is extremely troubling. "When the next president of America takes his oath of office in January, officers of Russian intelligence can savor a historic win. And that astonishing, appalling fact has divided, not united, the two parties that run the world's great democracy. That should be enough to unsettle anyone," the magazine said. This comes against a backdrop of Americans and Russians steadily lowering their opinion of each other over the past decade, as the Pew Research Center has noted. On another front, Trump and his team are openly critical of the CIA and U.S. intelligence on Russia, something that used to be sacrosanct. "I don't believe it. I don't believe they interfered" in the election, Trump told Time. Trump's transition team also chimed in. "These are the same people that said Saddam Hussein had weapons of mass destruction," it said a brief statement Friday, referring to the intelligence agencies. Some prominent Republicans have offered a similarly blasé response. "All this 'news' of Russian hacking: it has been going on for years," Sen. John Cornyn of Texas said in a tweet. "Serious, but hardly news." However, Republicans are far from united. "I have the highest confidence in the intelligence community, and especially the Central Intelligence Agency," Senate Republican leader Mitch McConnell said Monday. A pair of Republican senators, John McCain of Arizona and Lindsey Graham of South Carolina, teamed up with a pair of Democrats, Charles Schumer of New York and Jack Reed of Rhode Island, to call for a bipartisan look into the allegations of a Russian cyberattack. "Democrats and Republicans must work together, and across the jurisdictional lines of the Congress, to examine these recent incidents thoroughly," the senators said in a statement. That's a notion that Arthur Vandenberg would embrace. The Michigan senator was a longtime isolationist, but after World War II, he changed his thinking and argued that the U.S. needed to work out international arrangements that transcended partisan politics. "To me 'bipartisan foreign policy' means a mutual effort," he wrote, "under our indispensable two-party system, to unite our official voice at the water's edge so that America speaks with maximum authority against those who would divide and conquer us and the free world." Greg Myre is the international editor of NPR.org. Follow him on Twitter @gregmyre1.